What is Merge Dance Theatre? Program commencement date: Saturday 24th February 2018. 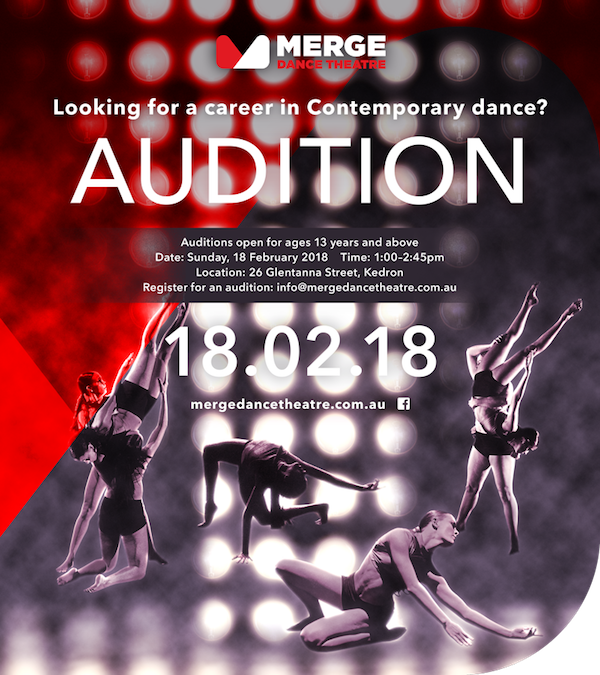 MERGE will enhance and develop the artistic individuality in each dancer, challenging them to explore and create contemporary dance while collaborating with some of Australia’s leading contemporary artists. Under the expert guidance of specialised teachers, MERGE Dance Theatre performers aged 13yrs and above will be selected from our February auditions and given the opportunity to work with leading contemporary dance artists and be exposed to current industry professionals. This unique program will bring together likeminded young dancers who are looking for a unique and challenging experience to accelerate their training and skills to that of a professional standard. Merge sessions will incorporate dance, choreographic skills, improvisation skills, collaboration work, partner work and acting skills into rehearsal and performance. Be part of something amazing in 2018! Register for an audition NOW! Junior Merge Dance Theatre NEW to 2018 for students aged 11 – 14yrs. Email now for more information!